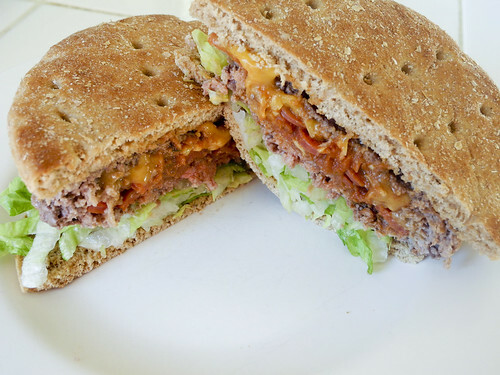 My husband is a burger fan and when I first started changing our diet I thought that we were going to have to cut them out. But then I found that you can purchase ground beef at the same fat percentage as low fat turkey: 93% fat free. Yes beef has a few more calories, but my husband prefers the taste over turkey. He hasn’t even noticed that we switched to the low fat version of ground beef. Now the one thing I am having a hard time switching to is turkey pepperoni, but I have just decided he will have to suffer! I can’t taste a difference and the difference in calories is huge. Since it is grilling season I decided I had to make a great stuffed burger. 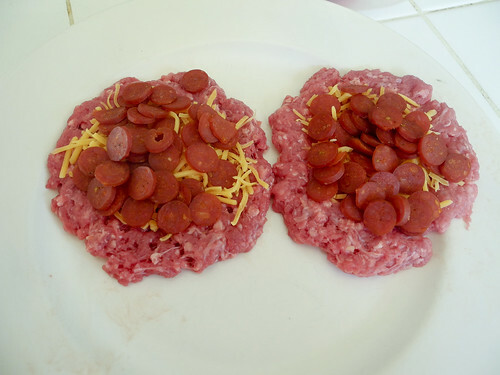 I had some pepperoni I wanted to use up in the fridge and realized what a great combo – burgers and pizza. turkey pepperoni? that’s new to me! I love pepperoni so need to check that out. Turkey pepperoni! You have saved our family! Who knew? They have agreed to eat turkey bacon, which apparently tastes close enough, but everyone was griping about no pepperoni on the pizza. We have cut pork out of our diet, and most soy and all soda after discovering what it does to your body, and how they make Pepsi using aborted babies corpses. Even gummy worms are beyond disgusting. I think that companies should be required to label products with EXACTLY what is in them, with pictures! I’m pretty sure we would go back to a more natural diet. Stepping off my soap box…any way thanks again for the pepperoni update! After exploring a handful of the blog articles on your web site, I really appreciate your technique of blogging. I added it to my bookmark webpage list and will be checking back in the near future. Please visit my web site as well and let me know how you feel. I just found those little turkey pepperonis. We use them with leftover pizza dough and make little pizza balls with them. Combines two totally favorites into one….kids and grown ups a like love this one.